The quality checks help to catch common translator errors to make sure the translation is in good shape. The checks are divided into three severities and can be ignored in case there is a false positive. 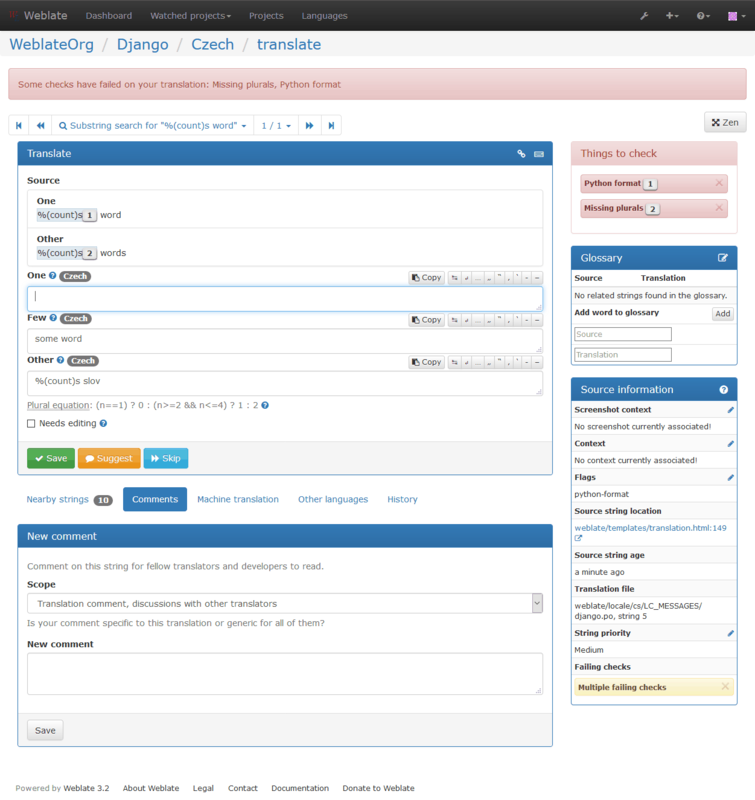 In addition to Quality checks, Weblate can also automatically fix some common errors in translated strings. This can be quite a powerful feature to prevent common mistakes in translations, however use it with caution as it can cause silent corruption as well. Weblate does a wide range of quality checks on messages. The following section describes them in more detail. The checks also take account special rules for different languages, so if you think the result is wrong, please report a bug. The source and translated strings are identical at least in one of the plural forms. This check ignores some strings which are quite usually the same in all languages and strips various markup, which can occur in the string, to reduce the number of false positives. This check can help finding strings which were mistakenly not translated. A space in the beginning is usually used for indentation in the interface and thus is important to keep. Source and translation do not both end with a space. Source and translation do not both end with a full stop. Full stop is also checked in various language variants (Chinese, Japanese, Devanagari or Urdu). When the original string is a sentence, the translated one should be a sentence as well to be consistent within the translated content. Source and translation do not both end with a colon or the colon is not correctly spaced. This includes spacing rules for languages like French or Breton. Colon is also checked in various language variants (Chinese or Japanese). Source and translation do not both end with a question mark or it is not correctly spaced. This includes spacing rules for languages like French or Breton. Question mark is also checked in various language variants (Armenian, Arabic, Chinese, Korean, Japanese, Ethiopic, Vai or Coptic). Question mark indicates question and these semantics should be kept in translated string as well. Weblate also checks for various typographic conventions for question mark, for example in some languages it should be preceded with space. Source and translation do not both end with an exclamation mark or it is not correctly spaced. This includes spacing rules for languages like French or Breton. Exclamation mark is also checked in various language variants (Chinese, Japanese, Korean, Armenian, Limbu, Myanmar or Nko). Exclamation mark indicates some important statement and these semantics should be kept in translated string as well. Weblate also checks for various typographic conventions for exclamation mark, for example in some languages it should be preceded with space. An ellipsis is usually rendered nicer than three dots, so it’s good to keep it when the original string was using that as well. Source and translation do not both end with a semicolon. This can be useful to keep formatting of entries such as desktop files. Source and translation usually do not have same amount of characters, but if the translation is too long, it can be affect a rendered shape. For example, in some UI widget, it should be kept in a specific length of characters in order to show the complete translation within limited space. Format string does not match source. Omitting format string from translation usually cause severe problems, so you should really keep the format string matching the original one. 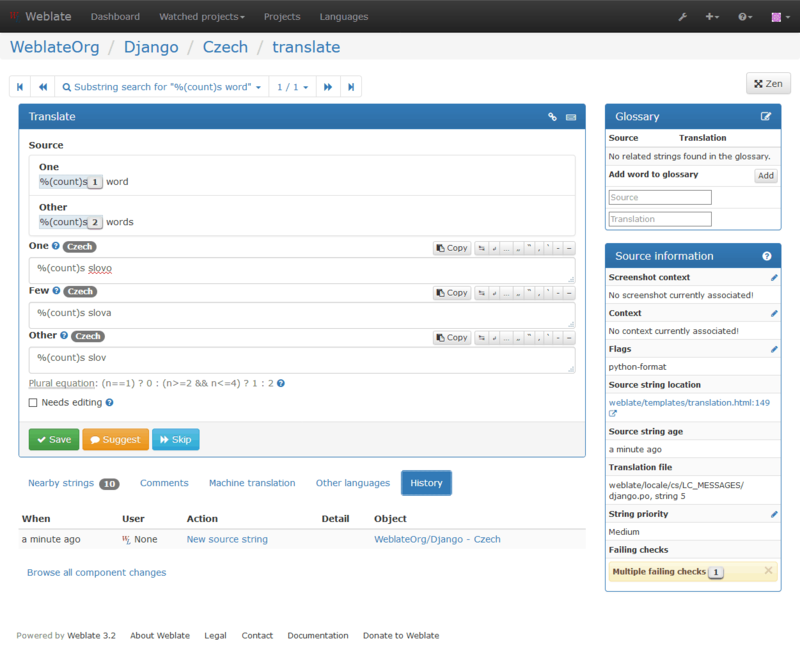 Weblate supports checking format strings in several languages. The check is not enabled automatically, but only if string is flagged by appropriate flag (eg. c-format for C format). Gettext adds this automatically, but you will probably have to add it manually for other file formats or if your po files are not generated by xgettext. This can be done per unit (see Additional information on source strings) or in Component configuration. Having it defined in component is simpler, but can lead to false positives in case the string is not interpreted as format string, but format string syntax happens to be used. Not filling in some plural forms will lead to showing no text in the application in the event the plural would be displayed. Some plural forms are translated the same. In most languages the plural forms have to be different, that’s why this feature is actually used. This string has been translated in the past. This can happen when the translations have been reverted in VCS or otherwise lost. Number of \\n literals in translation does not match source. This character is usually inserted by mistake, though it might have a legitimate use. Some programs might have problems when this character is used. The XML markup is invalid. Using the Unicode character is in most cases the better approach and looks better when rendered. More translations of this string have some failed quality checks. This is usually an indication that something could be done about improving the source string. This check can quite often be caused by a missing full stop at the end of a sentence or similar minor issues which translators tend to fix in translations, while it would be better to fix it in a source string.